데이터 처리장치 및 액세스 요구 발생방법을 제공한다. It provides a data processing apparatus and an access request generation method. 외부로부터 버스 마스터에 수신된 신호에 따라 상기 데이터 처리장치의 보안 도메인 또는 비보안 도메인에서 동작할 수 있는 버스 마스터가 구비된다. The bus master capable of operating in secure domain or non-secure domain of the data processing device is provided in accordance with the received signal to a bus master from the outside. 신호는, 버스 마스터의 정상 동작시에 고정되도록 발생된다. Signal is generated so as to be fixed at the time of normal operation of the bus master. 그 버스 마스터 디바이스가 보안 도메인에서 동작하고 있는 경우, 디폴트 메모리 맵이나 안전하게 정의된 메모리 영역 디스크립터에 따라, 보안 액세스 또는 비보안 액세스를 나타내는 버스 마스터 코어에 의해 발생된 액세스 요구와 연관된 도메인 지정 신호를 발생할 수 있는 제어 로직이 구비된다. The bus master device when operating in the secure domain, a default memory map and safely according to the defined memory area descriptors, can cause the access request and the domain-specific signal associated generated by the bus master core showing a security access or non-access the control logic is provided with. 이와 같이, 보안 도메인에서 동작하는 버스 마스터는, 그 자체가 보안 동작과 비보안 동작간에 전환 가능하지 않고, 보안 액세스와 비보안 액세스 양쪽을 발생할 수 있다. In this way, the bus master is operating in the secure domain, in itself it is not possible to switch between secure and non-secure operating action, can cause a security access and non-secure access both. 데이터 처리장치, 보안 도메인, 버스 마스터, 액세스 요구. Data processing equipment, security domains, the bus master access request. 본 발명은, 데이터 처리장치 및 방법에 관한 것으로, 특히 메모리에 있는 보안 및 비보안 데이터로의 액세스를 관리하는 것에 관한 것이다. The present invention relates to data processing apparatus and method, and more particularly, to managing access to secure and non-secure data in the memory. 프로세서 상에서 가동하는 애플리케이션들 중 적어도 하나에서 사용하는 데이터 항목(예를 들면, 명령어 또는 데이터 값)이 그 프로세서 상에서 가동될 수 있는 다른 애플리케이션에 의해 액세스 불가능해야 하는 감지 데이터 항목인 경우도 있다. Using at least one of the applications running on the processor data items (e. G., Instruction or data value) is also detected when the data items that should not be accessible by other applications that may be running on that processor. 그 데이터 처리장치가 스마트 카드인 경우의 일례가 있을 것이고, 상기 애플리케이션 중 하나는, 예를 들면, 보안 키 등의 감지 데이터를 사용하여 검증, 인증, 암호 해독 등을 행하는 보안 애플리케이션이다. There will be an example of the case where the data processing apparatus is a smart card, one of the applications is, for example, a security application using the detection data such as secret key for performing the validation, authentication, decryption and the like. 상기와 같은 경우에, 다른 애플리케이션들, 예를 들면, 보안 데이터를 액세스할 목적으로 상기 데이터 처리장치에 로딩되었던 해킹 애플리케이션들이 액세스할 수 없도록 상기 보안 데이터의 보안을 확실하게 유지하는 것이 아주 중요하다. In the case as described above, other applications, for example, to prevent hacking applications in order to access the security data that has been loaded into the data processing units to gain access it is very important to reliably maintain the security of the secure data. 종래의 시스템에 있어서, 운영체계 개발자의 작업은, 그 운영체계가 충분한 보안을 확실하게 제공하여 그 운영체계의 제어하에 가동하는 다른 애플리케이션이 일 애플리케이션의 보안 데이터를 확실하게 액세스할 수 없게 하는 것이 일반적이 었다. That in the conventional system, the operation of the operating system developer, the operating system is not a sufficient number of security by reliably provided to securely access the security data from the other application is il applications running under the control of the operating system in general this was. 그렇지만, 시스템이 보다 복잡해짐에 따라, 운영체계가 보다 커지고 보다 복잡해지는 것이 일반적인 추세이고, 이러한 경우에 운영체계 자체 내에서 충분히 보안하는데 점점 어려워진다. However, depending on the system becomes more complex, the general trend is that the operating system is becoming increasingly more complicated than that, it becomes increasingly difficult to secure enough within the operating system itself in this case. 따라서, 운영체계 보안에 관한 의존도를 경감시키기 위해서, 별개의 도메인이 데이터 처리장치에 제공된 시스템을 제공하는 것이 알려져 있고, 이들 도메인은 하드웨어 수준에서 보안을 핸들링하는 메카니즘을 제공한다. Therefore, in order to reduce the reliance on the operating system security, a separate domain is known to provide a system provided in the data processing apparatus, and these domains provides a mechanism for handling security at the hardware level. 이러한 시스템은, 예를 들면 공통 양도된 US 동시계속 특허출원번호 10/714,561에 기재되어 있고, 여기서는 그 내용을 참고로 포함하며, 본 출원의 시스템은 보안 도메인과 비보안 도메인을 갖는 것으로 기재되어 있다. Such a system, for are described in such a common transfer US simultaneously continue Patent Application No. 10/714 561, in this case and its contents by reference, the system of the present application are described as having a secure domain and non-secure domain. 이 시스템에 있어서, 실제로는 상기 비보안 및 보안 도메인은 개개의 세계에서 확립하고, 이때의 보안 도메인은 다른 실행 공간으로부터 하드웨어 강화 경계에 의해 분리된 신뢰받는 실행 공간을 제공하고, 마찬가지로 상기 비보안 도메인은 신뢰받지 못하는 실행 공간을 제공한다. In this system, in fact, the non-secure and secure domain is established in each of the world and the secure domain in this case provides a trusted execution space separated by hardware enhanced boundary from other execution spaces and, as the non-secure domain trust It provides space does not run. 규정된 비보안 도메인에서 실행하는 프로그램은, 보안 데이터에 액세스하지 못한다. Programs running on the specified non-secure domain, it does not have access to secure data. 그래서, 각 액세스 요구는, 이와 연관된 그 액세스가 보안 액세스인지 비보안 액세스인지를 식별하는 도메인 보안신호를 갖는다. Thus, each access request, whether associated with that access a secure access has a domain security signal that identifies whether the non-secure access. 데이터 처리장치가 보안 또는 비보안 도메인 중 한쪽에서 실행하는 프로그램에 액세스 가능한 기억소자(예를 들면, 캐쉬)를 갖는 경우, 적소에 보안 도메인에서 동작하는 프로그램에 의해 액세스하기 위한 상기와 같은 소자에 기억된 데이터를 비보안 도메인에서 동작하는 프로그램에 액세스 불가능하게 하는 메카니즘이 필요하다. The data processing apparatus is stored in the device as described above for access by a case having an accessible memory devices (e.g., cache) a program that runs on one of the secure or non-secure domain, the program operating in the secure domain in place a mechanism to disable access to the program that operates the data on the non-secure domain is required. 여기서, 그 내용이 참고로 포함된 공동 양도된 US특허출원번호 10/714,481에는, 대응한 데이터의 보안성을 나타내는 추가의 플래그가 캐쉬 라인에 설정된 데이터 처리장치가 기재되어 있다. Here, it is the contents of which include the commonly assigned US Patent Application Serial No. 10/714 481 incorporated by reference, is the addition of a flag that indicates the security of the corresponding data set in the cache line data process unit substrate. 캐쉬 라인의 데이터 가치가 (일반적으로 라인필(linefill) 프로세스의 일부로서) 상기 캐쉬에 기록되는 경우, 상기 연관된 플래그는 그 데이터가 보안 메모리 액세스나 비보안 메모리 액세스에 관련되는지를 식별하도록 설정된다. If the data value in the cache line (typically a line fill (linefill) as part of the process) to be recorded in the cache, the associated flag is set to identify whether the data is related to the security access memory or non-secure memory access. 그 후, 상기 캐쉬에 있는 일 데이터 항목으로의 액세스는, 도메인 보안 신호가 보안 액세스인 것을 나타내는 액세스 요구가 상기 연관된 플래그(들)로 나타낸 것과 같은 보안 캐쉬 라인을 참조할 수만 있도록, 마찬가지로, 도메인 보안 신호가 비보안 액세스인 것을 나타내는 액세스 요구가 상기 연관된 플래그(들)로 나타낸 것과 같은 비보안 캐쉬 라인을 참조할 수만 있도록, 참고로 상기 플래그에 대해 제한된다. Then, the access to a data item in the cache, so only to refer to the security cache line, such as a domain security signal indicated by the access flag (s) requires that the associated indicating that the secure access, and similarly, the domain security so that only the signal refers to a non-secure cache line, as indicated by the non-secure access in which the associated flag indicating that the access request (s), are limited with respect to the flag by reference. 따라서, 이러한 접근법은, 상기 비보안 도메인에서 동작하는 프로세스가 연관된 플래그가 보안 데이터를 포함하는 것을 나타내는 캐쉬에서 어떠한 엔트리들도 액세스하지 못하게 한다. Therefore, this approach, there is a flag associated with the process is operating in the non-secure domain not access; no entry in the cache indicates that it comprises a security data. 이러한 방법은 캐쉬에 액세스하는 프로세서 이전에 상기 캐쉬를 출력해버릴 필요가 없어 보안 도메인 동작으로부터 비보안 도메인 동작으로 천이한다. This method eliminates the need to discard the output of the cache to the processor before accessing the cache transitions the non-secure domain, the secure domain the operation from the operation. 이러한 시스템이 보안 데이터의 보안성을 보호하는 역할을 하지만, 실제로 상기 보안 도메인과 비보안 도메인간의 데이터의 일부 공유가 바람직한 경우도 있다. This system serves to protect the security of the secure data, when there is actually a part of the secure domain and share data between non-secure domain preferred. 이것의 일례는 그 자체가 보안 도메인에서 동작해야 하는 암호 해독 프로세스이지만, 비보안 프로세스들에 액세스 가능하게 하는데 적절한 암호 해독된 데이터를 생성한다. An example of this is in itself, but the decryption process to be operating in the secure domain, and generates the appropriate decrypted data to enable access to non-secure processes. 이러한 데이터는, 비보안 프로세스에 의해 액세스될 수 있는 경우로부터 비보안 메모리 영역에 기록되어야 한다. This data is to be written to the non-secure memory region from the case that can be accessed by a non-secure processes. 보안 및 비보안 도메인 양쪽에서(이때의 특수한 모니터 코드는 일 도메인으로부터 다른 도메인으로의 천이를 관리하는데 사용됨) 동작할 수 있는 프로세서를 제공하는 것이 알려져 있다. In both secure and non-secure domain, it is known to provide a processor that is operable (a special monitor code at this time is used to manage the transition from one domain to another domain). 이러한 일 시스템에 있어서, 상기 보안 도메인에서 동작하는 프로그램은, 액세스 요구를 비보안 메모리에 발행하고, 비록 그 보안 도메인으로부터 액세스 요구가 발행될지라도 비보안으로서 그 데이터 액세스 요구를 마킹할 수 있다. In such a system, the program operating in the secure domain, even if the issue an access request to non-secure memory, even though an access request issued from the secure domain may be marking the data as a non-secure access requests. 이에 따라, 보안 프로세스가 데이터를 비보안 메모리 지점에 데이터를 기록할 수 있고, 그 데이터가 캐쉬에 유지되는 경우, 관련 캐쉬 라인의 플래그가 비보안으로서 마킹될 수 있어, 프로세서 상에서(또는 실제로 다른 프로세서 상에서) 실행하는 그 이후의 비보안 프로세스는 그 캐쉬로부터 그것에 액세스하여도 된다. Accordingly, there is a security process can write data to non-secure memory location of data, in the case where the data is held in the cache, there is a flag of the relevant cache line may be marked as a non-security, (or indeed on another processor) on a processor after that the non-secure process running is also to access it from the cache. 그렇지만, 보안 도메인 및 비보안 도메인 양쪽을 지원하는 프로세서의 복잡도는, 많은 애플리케이션에 대해 불필요할 뿐만 아니라, 잠재적인 보안 취약성을 나타내기도 하는데, 그 이유는, 상기 보안 도메인 또는 비보안 도메인에서의 프로세스를 실행하는 프로세서의 능력이 해킹 공격의 대상일 수 있기 때문이다. However, the complexity of the processor that supports both the secure domain and non-secure domain is not only unnecessary for many applications, the potential to also represent a security vulnerability, that's why, to run the process in the security domain or non-domain this is because the processor's ability to be the target of hacking attacks. 또한, 프로세서가 보안 및 비보안 도메인 양쪽에서 동작하는 능력과 연관된 추가의 로직을 설치해야 하는 것을 피하는 것이 이로울 것이다. In addition, it would be beneficial to avoid the need to install additional processors of the logic associated with the ability to operate in both secure and non-secure domain. 그렇지만, 일 보안 도메인(예를 들면, 보안 도메인)에 설치된 프로세서는, 서로 다른 도메인 보안 신호를 발생할 수 없을 것이고, 실제로 그 시스템 내에 다수의 도메인을 인식하지 못하는 것이 일반적일 것이다. However, a security domain, the processor is installed on (e.g., the security domain), it will not be with each other may cause a different security domain signal, will actually be generally unaware of the number of domains within the system. 따라서, 이것에 의해, 상기 설치된 도메인 프로세서에서 사용한 데이터를 다른 도메인에서 동작하는 또 다른 프로세서와 공유할 경우 문제가 생긴다. Thus, a result, a problem arises when sharing with another processor operative data used by the processor installed domain from other domains. 설치된 도메인 프로세서가 보안 도메인에서 동작하고 있던 예로 가정하면, 이 프로세서로부터 발생하는 액세스 요구 모두는, 외부적으로 보안 액세스로서 표가 붙여질 수 있다. Assuming for example a processor installed in the domain that was operating in the secure domain, all access requests originating from the processor, externally, may be attached as a security table is accessed. 비보안 프로세스와 데이터를 공유하는 경우, 이러한 보안 액세스는 비보안 메모리 영역을 액세스하도록 허용될 필요가 있을 것이다. When sharing a non-secure processes and data, such a security access will need to be allowed to access the non-secure memory regions. 그렇지만, 이러한 액세스가 허용되는 경우에도, 상기 설치된 보안 프로세서의 활동의 결과로서 상기 캐쉬에 기억된 임의의 데이터가 보안으로서 마킹된 대응한 캐쉬 라인 플래그를 가질 것이므로, 캐쉬가 사용되는 경우 문제가 발생하고, 그에 따라서 비보안 프로세스에서는 볼 수 없을 것이다. However, even if such access is allowable, and as a result of the activity of the secure processor the installation, because any of the data stored in the cache is to have a corresponding one cache line flag marked as secure, is a problem when the Cache is used generate , and accordingly it will not see the non-secure processes. 이러한 문제점을 해결하기 위한 일 해결책에 의해, 보안 액세스와 비보안 액세스 양쪽을 허용하는 비보안 메모리의 캐쉬 가능하지 않은 영역을 상기 프로세서가 사용하게 할 것이고, 또 이러한 해결책은 캐쉬를 사용하는 것으로 인해 속도 이득과 절전 이득을 상실하다. In accordance with a solution to solve this problem, the security access and non-secure access cache is not enabled area of ​​the non-secure memory that allows both will make the processor to use, and this solution is due to the use of cache speed gain and sleep loss is a gain. 이에 따라서, 보안 도메인간의 천이 능력 자체 없이 단순 프로세서에 의해 동작할 수 있는 기술을 제공하고, 또 보안 및 비보안 도메인 양쪽 및 데이터가 존재하는 경우의 데이터 처리장치 내에서 유연한 동작을 계속 유지하는 것이 바람직할 것이다. This therefore provides a technique that can be operated by a simple processor without transition capability itself between the secure domain, and further secure and non-secure domain, each side and it is desirable that the data is retained and flexible operation in a data processing device, if present will be. 제 1 국면에서 본 발명은, 데이터 처리장치의 디바이스가 동작 가능하며 적어도 하나의 비보안 도메인 및 적어도 하나의 보안 도메인으로 이루어진 복수의 도메인을 갖고, 상기 보안 도메인에서 상기 디바이스가 비보안 도메인으로부터 액세스 가능하지 않은 보안 데이터에 액세스하는 데이터 처리장치로서, 특정 도메인에서만 동작하고, 데이터에의 액세스를 필요로 하는 경우 상기 데이터의 어드레스를 지정하는 액세스 요구를 발행할 수 있는 버스 마스터 디바이스와; The present invention in a first aspect is a device of a data processing apparatus operable and at least a plurality of domains comprising a non-secure domain and at least one secure domain, not the device is accessible from the non-secure domain by the secure domain a data processing apparatus for accessing secured data, and only the operation and, in the case that requires access to the data bus can issue an access request specifying an address of the data, the master device specific domain; 상기 액세스 요구가 슬레이브 디바이스에 라우팅되고, 버스 상에서 상기 라우팅된 각 액세스 요구가 그 액세스 요구에 관한 도메인을 식별하는 이 액세스 요구와 관련된 도메인 보안 신호를 갖는 버스; Said access request is routed to a slave device, each access request routed over the bus with the bus having a domain security signal associated with the access request identifying a domain relating to the access request; 및 상기 버스 마스터 디바이스가 동작하고 있는 도메인을 식별하기 위하여 상기 버스 마스터 디바이스의 외부로부터 발생된 도메인 지정 신호를 수신하도록 동작하는 도메인 제어 로직을 구비하고, 상기 버스 마스터 디바이스가 상기 보안 도메인에서만 동작하고 있는 것을 상기 도메인 지정 신호가 나타내는 경우, 상기 액세스 요구에 의해 지정된 상기 어드레스에 따라, 상기 도메인 제어 로직은, 상기 액세스 요구와 연관되는 비보안 도메인 보안신호를 선택적으로 발생할 수 있다. And said bus master device to identify which action domain and a domain control logic operable to receive a domain specifying signal generated externally of said bus master device, which is the bus master device operates only in the secure domain if said domain specifying signal indicates that, in accordance with the address designated by the access request, the domain control logic, may optionally be caused by the non-secure domain security signal to be associated with the access request. 본 발명에 따른 데이터 처리장치는 적어도 하나의 보안 및 비보안 도메인을 갖고, 이때의 데이터 처리장치 내에 보안으로서 표시된 데이터가 비보안 도메인에서 실행하는 프로세스들에 액세스 가능하지 않다. Data processing apparatus according to the present invention have at least one of the secure and non-secure domain, wherein the data is displayed as a security in the data processing device is not accessible to processes running on the non-secure domain. 버스 마스터 디바이스는, 보안 도메인에서 또는 비보안 도메인에서 동작하는지를 판정하는 외부 라인의 신호를 수신한다. Bus master device receives a signal from an external line to determine if the secure domain or non-secure domain in operation. 이 신호는, 버스 마스터를 "설치하여" 상기 보안 또는 비보안 도메인에서 동작한다. This signal, the bus master "to install" operates in the secure or non-secure domain. 버스 마스터 디바이스가 버스를 통해 라우팅되는 액세스 요구를 슬레이브 디바이스에 발행할 때, 도메인 제어 로직은 상기 액세스 요구와 연관된 도메인 지정 신호를 발생할 수 있다. When the bus master device to issue an access request routed over the bus to the slave device, the domain control logic may generate the domain-specific signal associated with the access request. 상기 버스 마스터 디바이스가 보안 도메인에서 동작하고 있는 경우, 상기 도메인 제어 로직은, 상기 액세스 요구에서 지정된 어드레스에 따라, 비보안 도메인 지정 신호를 발생할 수 있다. When the bus master device that is operating in the secure domain, said domain control logic, according to the address specified in the access request, it is possible to cause the non-secure domain specifying signal. 외부 신호로 상기 보안 도메인을 지정한 것은, 상기 버스 마스터 디바이스 내에 설치되어야 하는 상기 로직을 간소화한다. It is specified as an external signal to the security domain, to simplify the logic that must be installed in the bus master device. 더욱이, 그 보안 도메인이 버스 마스터 디바이스에 내부적으로 지정되지 않으므로, 버스 마스터 디바이스는, 시스템 설계자의 의도대로 작용하도록 신뢰받을 수 있고, 악성 코드가 무엇이든지간에 해커가 관리하여 버스 마스터 디바이스에 관해 실행할지도 모르므로, 보안 도메인 전환(특히, 비보안 도메인으로부터 보안도메인으로의 전환)은 옵션이 아니다. Moreover, because the security domain is not specified as internal to the bus master devices, bus master device, the map can be trusted to act as the system's designers intended by hackers Administration between malicious code whatsoever to run on bus master devices as moreumeu security domain transition (in particular, the transition to a secure domain from a non-secure domain) is not an option. 또한, 상기 도메인 제어 로직에 의해, 보안( 및 따라서 신뢰받는)프로세스에 대해, 선택된 액세스 요구는, 보안 도메인에서 생기는 것에도 불구하고, 어드레스 의존 방식으로 비보안으로서 표시될 수 있다. Further, by the domain control logic, security (and therefore trusted) for the process, the access request is selected, it can be Despite what occurs in the secure domain and non-secure as shown in the address-dependent manner. 이것은, 보안 프로세스가 비보안 지점으로서 규정된 저장지점에 데이터를 기록 가능하게 하거나, 캐쉬 등의 공유 자원에 데이터를 저장하고 그것을 비보안 데이터로서 표시 가능하게 하여, 나중에 비보안 프로세스는 그 데이터를 액세스하여도 된다. This is a secure process to enable writing data to the storage location defined as a non-secure point, save the data to a shared resource, such as a cache, and enables display it as a non-secure data, future non-secure process is also possible to access the data . 일 실시예에서, 상기 도메인 제어 로직은, 다수의 메모리 영역의 각각에 대해 액세스 제어 정보를 식별하는 메모리 맵과, 상기 보안 도메인에서 동작하면서 상기 버스 마스터 디바이스에서 액세스 요구를 발행하는 경우 상기 메모리 영역 내에 어드레스를 지정하는 액세스 요구와 연관지어 발행되어야 하는 도메인 보안 신호의 표시에 액세스 한다. In one embodiment, within the domain control logic, and memory map identifying access control information for each of the plurality of memory areas, while operating in the secure domain when issuing an access request from said bus master device, the memory area associated with the access request specifying an address constructed to access the display of the domain security signal that should be issued. 이에 따라서, 버스 마스터 디바이스가 보안 도메인에서 동작하고 있을 때, 액세스 요구는, 보안으로서 지정된 메모리의 영역뿐만 아니라, 상기 메모리 맵을 참조하여 비보안으로서 지정된 것들에 성공적으로 발행되어도 되고, 이것에 의해 버스 마스터가 상기 메모리 맵의 모든 에어리어의 적절한 보안성을 "알 수 있다". Accordingly, the bus when the master device is operating in secure domain, the access request, as well as the area of ​​the designated memory as a security, and be successfully issued to those designated as non-security with reference to the memory map, by which the bus master adequate security of all areas of said memory map "can see". 다른 실시예에서, 상기 도메인 제어 로직은, 영역 디스크립터를 액세스하고, 각 영역 디스크립터는, 메모리 영역과 연관되고, 그 메모리 영역에 대해 영역 보안 표시를 제공하고, 상기 영역 디스크립터는 보안 도메인에서 실행하는 소정의 소프트웨어에 의해 프로그래밍 가능하고, 상기 도메인 제어 로직은, 상기 액세스 요구에서 지정한 어드레스를 포함하는 상기 메모리 영역에 대한 상기 영역 디스크립터의 상기 도메인 지정 신호와 상기 영역 보안 표시의 조합으로부터 액세스 요구마다 상기 도메인 보안 신호를 얻을 수 있다. In another embodiment, certain of the domain control logic, and access the region descriptors, each region descriptor, is associated with a memory region, providing a region security indication for that memory region, said region descriptors are executed in the security domain, by a software-programmable, said domain control logic, wherein the access from a combination of the specified including the address specified in the request the domain of the region descriptor for the memory region signal and said region security indication for each access request to the domain security it is possible to obtain a signal. 이와 같이, 메모리의 특정 영역은, 신뢰받는 소프트웨어에 의해 편집될 수 있는 대응한 영역 디스크립터에 의해 규정된 그들의 액세스 허가 및 영역 속성을 가질 수 있다. In this way, certain areas of the memory, can be defined by a corresponding region descriptor that can be edited by the trusted software to have their access permission and region attribute. 특정 메모리 영역에 대한 영역 디스크립터는, 예를 들면 그 영역에의 액세스들이 캐쉬 가능하고, 버퍼 가능한지를 식별하는 하나 이상의 영역 속성을 일반적으로 제공하고, 추가로, 예를 들면 프로세서 코어가 소정의 동작 모드 상태에 있는 경우만 당해 영역이 액세스 가능한지와, 그것이 액세스 가능한 경우 판독 및 기록 액세스가 허용되거나 판독 액세스만이 허용되는지 등을 식별하는 하나 이상의 액세스 허가를 일반적으로 지정할 것이다. Region descriptor for a particular memory region, for example, further access to the region to cache possible, providing at least one region attribute that identifies the buffer is possible in general, and, for example, the processor core is a predetermined operation mode, and only the art area is accessible if the state, it will assign one or more access authorization to identify the access, etc. in general, if the read and write access is allowed if possible, or read only access is allowed. 이렇게 하여, 메모리의 특정 영역의 보안 상태는, 그 데이터 처리장치의 동작시에 필요로 하는 것을 필요로 함에 따라, 동적으로 변경될 수 있다. In this way, the security status of a specific area of ​​memory, and can be changed dynamically as the need to require the operation of the data processing apparatus. 바람직한 실시예에서, 상기 도메인 제어 로직은, 상기 도메인 지정 신호가 버스 마스터 디바이스를 보안 도메인에서만 동작하고 있는 것을 나타낼 때 상기 영역 보안 표시에 따라 상기 도메인 보안 신호를 발생할 수 있다. In a preferred embodiment, the domain control logic, the said domain specifying signal may cause said domain security signal in accordance with said region security indication to indicate that operates only in the secure domain for the bus master device. 이렇게 하여, 대응한 영역 디스크립터에 따라 액세스 요구를 수반하는 도메인 보안 신호의 보안을 버스 마스터 디바이스가 변경하는 능력은, 보안 도메인에서 동작하는 경우만 야기된다. In this way, corresponding to the security of the bus master device in the domain security signal that involves an access request to change depending on the region descriptor capabilities, it is caused only when operating in the secure domain. 도메인 보안 신호를 발생하는 상술한 메카니즘의 상대적 우선권이 가변적일 수 있다는 것을 알지만, 바람직한 실시예에서 상기 어드레스가 영역 디스크립터를 갖는 메모리 영역에 있는 경우, 상기 도메인 보안 신호는 상기 영역 보안 표시 및 상기 도메인 지정신호의 상기 조합으로부터 얻어지는 한편, 이와는 달리 상기 도메인 보안 신호는 상기 메모리 맵으로부터 얻어진 상기 액세스 제어 정보로부터 얻어진다. I know that there is a relative priority of the above-described mechanism for generating a domain security signal may be variable, in the case in the preferred embodiment from a memory area having the said address region descriptor, said domain security signal is the region security indication and specifies the domain obtained from the combination of signals other hand, alternatively the domain security signal is derived from the access control information obtained from said memory map. 바람직한 실시예에서, 상기 도메인 제어 로직은, 상기 비보안 도메인에서 상기 버스 마스터 디바이스를 설치하는 것을 상기 도메인 지정신호가 나타내는 경우, 상기 도메인 보안 신호를 비보안으로서 항상 발생할 수 있다. In a preferred embodiment, the domain control logic, when said domain specifying signal indicates that the bus master device installed in said non-secure domain, it is possible to always cause the domain security signal as non-secure. 이와 같이, 보안 도메인에서 동작하는 버스 마스터 디바이스만은, 그 액세스 요구를 수반하는 도메인 보안 신호들의 보안을 조정할 수 있다. In this way, only the bus master device operating in the secure domain, it is possible to adjust the security of the domain security signal that involves the access request. 일 실시예에서, 상기 도메인 지정 신호는, 상기 버스 마스터 디바이스에 정적 입력이다. In one embodiment, it said domain specifying signal is a static input to said bus master device. 이에 따라서, 상기 버스 마스터 디바이스는, 일 특정 보안 도메인에 있도록 영구적으로 고정 배선되고 다른 보안 도메인으로 전환될 수 없다. Accordingly, the bus master device, and wiring permanently fixed to allow to one particular security domain can not be switched to the same security domain. 상기 도메인 지정 신호를 발생할 수 있는 많은 방식이 있다는 것을 알 수 있지만, 일 실시예에서 상기 데이터 처리장치는 도메인 지정 신호를 발생할 수 있는 보안 제어 로직을 더 구비한다. But can be seen that there are many methods that may occur to said domain specifying signal, in one embodiment, the data processing apparatus further comprises a security control logic that can generate a domain specifying signal. 이와 같이, 상기 보안 제어 로직은, 신뢰받는 시스템 설계자 지정 규칙들에 따라 상기 보안 도메인의 정의를 관리할 수 있다. In this way, the security control logic, it is possible to manage the definition of the secure domain in accordance with specified rules trusted system designer. 이러한 신뢰받는 규칙은, 상기 도메인 지정 신호가 상기 버스 마스터 디바이스의 리셋시에 변경 가능하기만 한 일 실시예로 입증된다. These trusted rule, said domain specifying signal is demonstrated by the embodiment but can be changed to reset the one example of the bus master device. 특정 보안 도메인에서 설치되는 상기 버스 마스터 디바이스가, 동작시에 보안 도메인과 비보안 도메인간에 천이할 수 없다는 것을 의미하는 것을 알 것이다. It said bus master device, which is installed in a particular security domain, it will be understood to mean that the operation can not be a transition between secure domain and non-secure domain. 그렇지만, 보안 도메인으로부터 비보안 도메인으로의 단일의 천이도 가능한 상황이 매우 제한되어도 된다. However, the single transition diagram of possible situations in the non-secure domain from the secure domain may be very limited. 특히, 버스 마스터 디바이스가 부팅시에 상기 보안 도메인에서 동작을 시작하는 일 실시예에서, 상기 보안 제어 로직은 비보안 도메인 지정신호를 부트 프로세스에서 나중에 발생하는 것을 전환할 수 있고, 이 후 상기 보안 제어 로직은 재부팅이 일어날 때까지 비보안 도메인 지정 신호를 생성할 수만 있다. In particular, the bus in one embodiment for the master device starts operating in the secure domain at boot-time, said security control logic is able to transition to occur later in the boot the non-secure domain specifying signal process, after the security control logic there are tens of thousands to create a non-secure domain specifying signal until a reboot occurs. 이렇게 하여, 데이터 처리장치가 부팅할 때, 상기 버스 마스터 디바이스는 상기 보안 도메인에서 짧게 동작하고, 또 신뢰받는 부트 코드가 실행되지만, 그후 그 부트 코드가 종료하기 전에 또는 그 부트 코드가 종료할 때, 버스 마스터 디바이스는, 재부팅하지 않고, 비보안 모드로 되고 다시 보안 모드로 전환될 수 없다. In this way, when the data processing device from which to boot, the bus master device when short operations, and further, but a trusted boot code is executed, and thereafter terminates the boot code before the end, or the boot code in the security domain, the bus master devices, without rebooting, and a non-secure mode can not be converted back into secure mode. 이것으로 확실한 것은, 버스 마스터가 부팅시에 셋업 목적을 위해 짧게 행하는 것이 이롭기도 한 상기 보안 도메인에서 버스 마스터에 의해 동작할 수 있는 시간동안에, 신뢰받는 부트 코드만이 실행되고 있고 상기 버스 마스터 디바이스가 상기 부트 코드가 종료하기 전에 비보안 도메인으로 비가역적으로 전환되므로 취약하지 않다는 것이다. It is clear in this respect, the bus master during the time that is operable by from one said security domain airway beneficial to carry out short for the set-up purposes at boot time the bus masters, only trusted boot code is running and that the bus master device because irreversible transition to a non-secure domain before the boot code is terminated is not vulnerable. 일 실시예에서, 상기 버스 마스터 디바이스 자체는, 시스템 내에서 일부의 보다 많이 신뢰받는 구성요소(예를 들면, 보안 도메인 내의 프로세서 상에서 실행하는 코드)를 거쳐 재부팅 프로세스를 시작할 수도 있다. In one embodiment, the bus master device itself, through the part receiving more reliable than the components (for example, code executing on the processor in the secure domain) in the system can start the reboot process. 이 제한된 상황들에서, 버스 마스터 디바이스는, 인증된 재부팅을 시작하여 비보안 도메인으로부터 보안 도메인으로 천이되게 할 수 있다. In these limited circumstances, the bus master device is rebooted to start the authentication can be presented to the security domain transition from the non-secure domain. 버스 마스터가 인증하는 상기 신뢰받는 코드를 사용하여 확실한 것은, 이 기능성이 해킹받지 않는 유효 코드에 의해 시작될 수만 있다는 것이다. It is obvious to use the trusted authentication code to the bus master, that it only started by a valid code, the functionality that is not compromised. 제 2 국면에서 본 발명은, 데이터 처리장치의 디바이스가 동작 가능하며 적어도 하나의 비보안 도메인 및 적어도 하나의 보안 도메인으로 이루어진 복수의 도메인을 갖고, 상기 보안 도메인에서 상기 디바이스들이 상기 비보안 도메인으로부터 액세스 가능하지 않은 보안 데이터에 액세스하는 데이터 처리장치로서, 특정 도메인에서만 동작하고, 데이터에의 액세스를 필요로 하는 경우 상기 데이터의 어드레스를 지정하는 액세스 요구를 발행하는 버스 마스터 수단과; The present invention in a second aspect is the device of a data processing apparatus operable and at least a plurality of domains comprising a non-secure domain and at least one secure domain, to the device in the secure domain inaccessible from the non-secure domain that is a data processing device to access the secure data, the bus master means for issuing an access request specifying an address of the data if that requires access to only work with a particular domain, and data; 상기 액세스 요구가 슬레이브 디바이스 수단에 라우팅되고, 버스수단 상에서 상기 라우팅된 각 액세스 요구가 그 액세스 요구에 관한 도메인을 식별하는 이 액세스 요구와 관련된 도메인 보안 신호를 갖는 버스수단; The access request is being routed to slave device means, each access request routed over the bus means having a domain security signal associated with the access request identifying a domain relating to the access request bus means; 및 상기 버스 마스터 디바이스가 동작하고 있는 도메인을 식별하기 위하여 상기 버스 마스터 디바이스의 외부로부터 발생된 도메인 지정 신호를 수신하도록 동작하는 도메인 제어 로직수단을 구비하고, 상기 버스 마스터 디바이스가 상기 보안 도메인에서만 동작하고 있는 것을 상기 도메인 지정 신호가 나타내는 경우, 상기 액세스 요구에서 지정된 상기 어드레스에 따라, 상기 도메인 제어 로직수단은, 상기 액세스 요구와 연관되는 비보안 도메인 보안신호를 선택적으로 발생한다. And to identify the domain is operating is the bus master device and a domain control logic means operative to receive a domain specifying signal generated externally of said bus master device, and that the bus master device operates only in the secure domain if said domain specifying signal indicates that, according to the address specified in the access request, the domain control logic means generates a non-secure domain security signal to be associated with the access request is optional. 제 3 국면에서 본 발명은, 데이터 처리장치의 디바이스가 동작 가능하며, 적어도 하나의 비보안 도메인 및 적어도 하나의 보안 도메인으로 이루어진 복수의 도메인을 갖고, 상기 보안 도메인에서 상기 디바이스들이 비보안 도메인으로부터 액세스 가능하지 않은 보안 데이터에 액세스하는 데이터 처리장치에서의 액세스 요구를 발생하는 방법으로서, 버스 마스터 디바이스에 외부적으로 도메인 지정 신호를 발생하여 그 버스 마스터 디바이스가 동작하고 있는 도메인을 식별하는 단계와, 데이터에의 액세스를 필요로 하는 경우 상기 데이터의 어드레스를 지정하는 액세스 요구를 상기 버스 마스터 디바이스로부터 발행하는 단계와, 상기 액세스 요구와 도메인 보안 신호를 연관시켜, 그 액세스 요구에 관계하는 도메인을 식별하는 단계와, 상기 보안 도 The present invention in a third aspect is, to a device of a data processing apparatus operable, having at least one non-secure domain and a plurality of domains comprising at least one secure domain, not the device that is accessible from the non-secure domain by the secure domain as that method for generating an access request in a data processing device to access the secure data bus to the master device by generating a domain specifying signal externally of the step and the data for identifying the domain in which the operation is that the bus master device when requiring access method comprising: an association step for issuing an access request specifying an address of the data from the bus master device, wherein the access request and the domain security signal, identifying a domain pertaining to that access request and, the security is also 인에서만 동작하고 있는 것을 상기 도메인 지정 신호가 나타내는 경우, 상기 어드레스에 따라, 상기 액세스 요구와 연관되는 비보안 도메인 보안신호를 선택적으로 발생하는 단계를 포함한다. If it said domain specifying signal indicating that the operation only of, and a step of, depending on the address, selectively generate the non-secure domain security signal to be associated with the access request. 도 5는 본 발명의 일 실시예에 따른 도 3의 제어 로직의 동작을 나타낸 흐름도이다. 5 is a flowchart showing operations of the control logic of Figure 3 according to one embodiment of the present invention. 도 1은 본 발명의 일 실시예에 따른 데이터 처리장치의 블록도이다. Figure 1 is a block diagram of a data processing apparatus according to an embodiment of the present invention. 버스(10)는, 데이터 처리장치의 각종 부품들을 연결하여, 특히 데이터 액세스 요구를 마스터 디바이스로부터 슬레이브 디바이스로 통과하고 기록되는 데이터 항목을 상기 마스터 디바이스로부터 상기 슬레이브 디바이스로 통과하거나 요구받은 판독 데이터 항목을 상기 슬레이브 디바이스로부터 상기 마스터 디바이스로 되돌림으로써 상기 각종 부품들이 서로 통신하게 한다. Bus 10, to connect the various components of a data processing apparatus, in particular, the read data item received through or request to the slave device to which the data item is passed to the slave device, and write data access request from the master device from the master device It causes the various components to communicate with each other by returning from the slave device to the master device. 전환 가능형 보안 프로세서(20)는, 액세스 요구들을 발행할 수 있는 버스마스터 디바이스의 일례이다. Switchable type security processor 20 is one example of the bus master device capable of issuing the access request. 추가로, 전환 가능형 보안 프로세서(20)는, 보안 도메인이나 비보안 도메인에서 동작할 수 있다. Further, the switchable type security processor 20 may operate in the secure domain or non-secure domain. 보안 도메인에서 동작하는 경우, 그 프로세서는 보안 데이터로서 표시된 데이터 처리장치 내의 데이터에 액세스한다. When operating in the secure domain, the processor accesses the data in the data processing apparatus shown as the security data. 데이터 처리장치에서의 데이터 항목의 주 저장 지점은, 시스템 캐쉬(40)를 거쳐 버스(10)에 연결된 메모리(30)이다. Note storage location of the data item in the data processing device is a memory 30 connected to the bus 10 via the system cache 40. The 또한, "고정된(fixed)" 보안 버스 마스터(50)는, 보안 도메인이나 비보안 도메인에서 동작할 수 있다. In addition, the "fixed (fixed)," secure bus master 50 is capable of operating in secure domain or non-secure domain. 그렇지만, 이 버스 마스터 자체는, 그것이 동작하는 보안 도메인 상에서 제어하지 못하고, 그것의 보안 도메인을 보안 제어 로직(60)으로부터 수신하는 신호 TZ_NS_CTL에 의해 한정된 보안 도메인을 갖는다. However, the bus master itself, this method can not control on secure domain it to operate, and has a defined security domain by receiving a signal TZ_NS_CTL its security domain from the security control logic 60. 보안 제어 로직(60)은, 상기 TZ_NS_CTL 신호가 버스 마스터(50)의 정상 동작시에 확실히 일정하고, 실제로 일 실시예에서 상기 TZ_NS_CTL 신호는 하이(high) 또는 로우(low)(즉, 영구 비보안 도메인 또는 보안 도메인 동작)가 되도록 "고정 배선"된다. Security control logic 60, the TZ_NS_CTL signal is the TZ_NS_CTL signal strictly constant, and in fact an embodiment in the normal operation of the bus master 50 is high (high) or low (low) (i.e., the permanent non-secure domain or it is "hardwired" to the secure domain behavior). 보다 일반적으로, 보안 제어 로직(60)은, 경로(75) 상에서 보안 제어 로직(60)에 신호를 보내는 시스템 제어기(70)에 의해 제어된다. More generally, the security control logic 60 is controlled by the system controller 70 sends a signal to the security control logic 60 over path 75. 일례에서, 버스 마스터(50)는, 암호 부호화 또는 복호화 등의 또 다른 "마스터" 프로세서에 서비스를 제공하는 "도우미(helper)" 프로세서이어도 된다. In one example, the bus master 50 may be a "helper (helper)" processor providing a service to another "master" processor, such as passwords coded or decoded. 이러한 예에서, 버스 마스터는, 암호 키 등의 감지 데이터를 핸들링하고 있으므로, 보안 도메인에서 연속적으로 동작할 것이다. In this example, the bus master, because the handling sense data such as encryption keys, would be operated continuously in the secure domain. 따라서, 보안 제어 로직(60)은, 연속 TZ_NS_CTL=0(보안) 신호를 제공할 것이다. Thus, the security control logic 60 will provide a continuous TZ_NS_CTL = 0 (security) signal. 또 다른 예에서는, 버스 마스터(50)의 보안 도메인이 정상 동작시에 설치되어도 되지만, 버스 마스터(50)의 단일의 일방식(one-way) 보안 도메인 천이를 허용하는 것이 유용한 상황이 매우 제한되기도 한다. In another example, bus secure domain of the master 50 is, but may be provided at the time of normal operation, the bus single one way of the master 50 (one-way) is that useful conditions that permit secure domain transition very limited also do. 예를 들면, 버스 마스터(50)는 데이터 처리장치의 부팅시에 보안 도메인에서 동작하지만, 이후 데이터 처리장치의 정상 동작시에 버스 마스터(50)는 비보안 도메인에서 동작을 계속하여도 된다. For example, bus master 50 is operating in the secure domain at boot time, but during normal operation the bus master 50 of the data processing unit since the data processing apparatus is also possible to continue the operation in the non-secure domain. 상기와 같은 천이가 확실히 일방식이도록, 본 예에서 보안 제어 로직(60)은, 보안으로부터 비보안으로의 천이를 나타내는 부트 시간동안 경로(75)에서 수신된 일 보안 도메인 천이 신호만이 응답되도록 구성된 후, 보안 제어 로직(60)은 경로 80 상의 시스템 제어기(70)로부터 리셋 신호를 수신할 때까지, 경로 75 상의 신호 변화에 상관없이 연속적이고 변화하지 않는 비보안 TZ_NS_CTL 신호를 발생할 것이다. After configured transitions as described above to ensure one way so, security control logic 60, in this example, only one security domain transition signal received from path 75, during boot-time at which the transition to the non-secure from security response , security control logic 60 will generate a non-secure TZ_NS_CTL signal it does not change continuously and regardless of the changes in the signal until receiving a reset signal from the system controller 70 on path 80, path 75. 버스 마스터(50)가 보안 도메인에서 동작하고 있을 때(예를 들면, 데이터 처리장치 부트 루틴동안), 버스 마스터(50)가 자신의 천이를 비보안 도메인으로 신호를 보낼 수 있는 것이 이롭기도 하다. Pray bus master 50 is beneficial in that when operating in the secure domain (e.g., during a boot routine, the data processing apparatus), the bus master 50 to send a signal to its switch to the non-secure domain. 이 때문에, 임시의 경로(85)는, 부팅 시간동안만 사용가능하여, 버스 마스터(50)는 보안 제어 로직(60)으로부터 TZ_NS_CTL신호의 변화를 직접 야기시킬 수 있다. For this reason, the path 85 of the temporary, and can only be used during boot time, the bus master 50 may cause the change of TZ_NS_CTL signal directly from the security control logic 60. 따라서, 버스 마스터(50)가 보안 도메인에서 더 이상 동작할 필요가 없을 때(예를 들면, 버스 마스터가 부트 루틴을 종료했으면) 그것은 즉시 비보안 동작으로 전환할 수 있다. Thus, when the bus master 50 is no longer necessary to operate in the security domain, you can switch immediately to non-secure operation (for example, the bus master Once you exit the boot routine) it. 그래서, 보안 동작으로의 전환은, 시스템 제어기(70)가 상기 보안 제어 로직(60)과 버스 마스터(50) 양쪽을 리셋할 때까지 가능하지 않다. Thus, the switching to the secure operation, it is not possible until the reset both the system controller 70, the security control logic 60 and the bus master (50). 도 2는 도 1의 시스템 캐쉬(40) 등의 캐쉬를 도시한 것이다. Figure 2 illustrates a cache, such as cache system 40 of FIG. 이러한 캐쉬는, 일반적으로 몇몇의 방식(100,110,120 등)으로 분할될 것이다. This is cached, and will generally be divided into several methods (100 110 120, etc.). 각 방식은 데이터를 보통 태그 어레이(130)와 데이터 어레이(14))로 분할되는 어레이에 데이터를 기억한다. Each system stores data in an array that is divided into the normal data tag array 130 and data array 14). 메모리(30)에 기억된 데이터 항목의 복사본은, 데이터 어레이(140)의 엔트리에 기억되고, 그들 데이터 항목과 연관된 추가의 정보는 태그 어레이(130)에 기억된다. Copy of the data item stored in the memory 30 is stored in the entry of data array 140, additional information associated with these data items are stored in the tag array 130. 이들 연관된 정보는, 일반적으로 태그(150), 더티 비트(160), 유효 비트(170) 및 NS비트(180)를 구비하여도 된다. The associated information is also usually provided with a tag 150, a dirty bit 160, valid bits 170 and NS bit 180. The 태그는, 데이터 어레이(140)에서 대응한 데이터 항목의 메모리 어드레스의 일부에 해당한다. Tag, which corresponds to a portion of the memory address of the data item in the corresponding data array 140. 더티 비트(160)와 유효 비 트(170)는, 상기 캐쉬 라인에 초기에 기억되었으므로 대응한 데이터 항목이 갱신되었는지의 여부와 상기 캐쉬 라인에서의 데이터 항목이 계속 유효한지의 여부를 각각 나타낸다. Dirty bit 160 and a valid bit 170, since initially stored in the cache line, respectively, whether or after a corresponding data item is still valid data entry in the presence and in the cache line has been updated. NS 비트는, 상기 캐쉬 라인과 연관된 보안 도메인에 해당한다. NS bits, corresponds to a security domain associated with the cache line. 이에 따라서, 보안 액세스의 서브젝트인 데이터로 채워진 캐쉬 라인의 NS비트는 0으로 설정되고, 비보안 액세스의 서브젝트인 데이터로 채워진 캐쉬 라인의 NS비트는 1로 설정된다. Accordingly, a subject of the data of the secure access NS bit of the filled cache line is set to zero, subject to the non-secure data access NS bit of the filled cache line is set to one. 이것에 의해, 비보안 프로세스들이 보안 데이터를 액세스하는 위험없이, 보안 도메인과 비보안 도메인 양쪽에서 상기 캐쉬가 공유될 수 있다. As a result, without the risk that non-secure processes to access the secure data, and that the cache may be shared by both the secure domain and non-secure domain. 이것은, 특정 보안 도메인으로부터 데이터 액세스 요구가 NS비트가 그 보안 도메인과 일치하는 캐쉬에서의 캐쉬 라인에 액세스할 수 있기 때문이다. This is because the data access request from a particular security domain can access the cache line in the cache to the NS bit match that security domain. 상기 액세스 요구의 서브젝트인 데이터를 송신 또는 수신한다. And transmitting or receiving the data the subject of the access request. 액세스 요구를 프로세서 코어(210)로부터 메모리 보호장치(MPU)(220) 내의 제어 로직(230)에 보내진다. An access request from the processor core 210 is sent to the control logic 230 in the memory protection unit (MPU) (220). 보안 제어 로직(60)에서 발생된 상기 TZ_NS_CTL신호는, 제어 로직(230)에 의해 수신된다. The TZ_NS_CTL the signal generated by the security control logic 60 is received by the control logic 230. MPU(220) 내의 디스크립터 테이블(240)에도 프로세서 코어(210)에서 발행된 상기 액세스 요구를 보낸다. Descriptor table in the MPU (220) (240) also sends a said access request issued by the processor core 210. 프로세서 코어(210)가 도메인 지정 신호 TZ_NS_CTL를 수신하지 못하므로, 프로세서 코어 자체는 보안 도메인을 알지 못하지만, 오히려 도메인 보안 표시는 프로세서 코어(210)로부터 수신된 액세스 요구, 도메인 지정 신호 TZ_NS_CTL 및 디스크립터 테이블(240)에 기억된 정보에 따라 MPU(220)에 의해 작성된다. Because the processor core 210 is not receiving a domain specifying signal TZ_NS_CTL, the processor core itself not know the secure domain, but rather a domain security indication of the access request, a domain specifying signal TZ_NS_CTL and descriptor table received from the processor core 210 ( depending on the information stored in 240) is created by the MPU (220). 도메인 보안 표시(NS-prot)를 생성하는 로직은 테이블 1에 요약된다. Logic to generate a security domain display (NS-prot) are summarized in table 1. 테이블 1에 나타낸 로직에 따라, 비보안=0 및 보안=1. In accordance with the logic shown in Table 1, the non-security and security = 0 = 1. TZ_NS_CTL=1(즉, CPU(200)가 비보안 도메인에서 동작하도록 설정된다)일 때, 발생된 보안 표시(NS-prot)는 항상 1이고, 이것이 의미하는 것은 비보안 도메인에서 동작하는 코어가 비보안 액세스를 발생할 수만 있다는 것이다. And TZ_NS_CTL = 1 is always 1 (that is, CPU (200) is set to operate in a non-secure domain) one time, and the generated security indicator (NS-prot), What this means is that the core operating in a non-secure domain the non-secure access that it only occurs. 이와는 달리, 메모리 보호장치가 인에이블되지 않고(MPU 인에이블=0) 상기 코어가 보안 도메인에서 동작하도록 설정되는 경우(TZ_NS_CTL=0), 상기 보안 표시 NS-prot는 테이블 2(아래에 기재됨)에 나타낸 것과 같은 디폴트 메모리 맵에 따라 결정된다. (Described below) In contrast, the memory protection device is a not enabled (MPU enable = 0), the core if it is set to operate in a secure domain (TZ_NS_CTL = 0), wherein the security indicator NS-prot is Table 2 that is determined according to the default memory map as shown in. 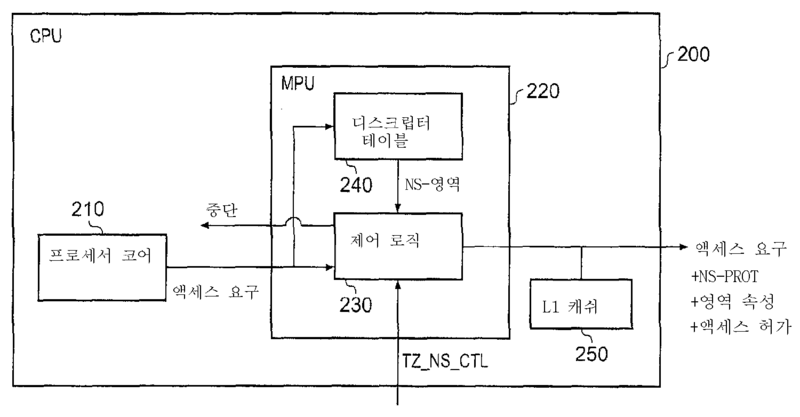 그렇지만, CPU가 보안 도메인에서 동작하도록 설정되고(TZ_NS_CTL=0) 상기 MPU가 인에이블되는 경우(MPU 인에이블=1), 상기 보안 표시 NS-prot는 분량 NS-영역의 값에 따라 결정된다. However, CPU is set to operate in a secure domain (TZ_NS_CTL = 0) when the MPU is enabled (MPU enable = 1), the security indicator NS-prot is determined by the value of the quantity NS- area. 디스크립터 테이블(240)에는, 메모리 어드레스 영역과 그들의 대응한 NS-영역 값들의 목록이 기억되어 있다. Descriptor table 240, there is stored a list of memory addresses and their corresponding region a region value NS-. 주어진 메모리 어드레스 영역 내에 속하는 어드레스에 대응한 데이터 액세스 요구에 의해, 디스크립터 테이블(240)이 그 목록에 기억된 것에 대응한 NS-영역의 값을 발생할 것이다. By a data access request corresponds to an address belonging to a given memory address regions, will cause the value of the NS- area corresponds to the descriptor tables 240 is stored in the list. 디스크립터 테이블(240)에 기억된 목록의 형태가 다양하다는 것을 알지만, 일 실시예에서 NS-영역은 MPU용 영역 액세스 제어 레지스터의 속성이다. We know that in the form of a list stored in a descriptor table 240. Various, NS- region in one embodiment is a property of the domain access control register for the MPU. 이들 레지스터는, 논리적인 제로값으로 즉, 디폴트로 리셋되도록 구성되고, 상기 보안 도메인에서의 동작은 보안 액세스를 생성할 것이다. These registers, in a logical zero value that is, is configured to be reset to default, the operation in the secure domain will produce a secure access. 일 실시예에서, 테이블 1에 기재된 NS-prot의 전환은 데이터 액세스 요구에 적용될 뿐이라는 것을 주목해야 한다. In one embodiment, the conversion of the NS-prot set forth in Table 1. It should be noted that only applied to the data access request. 이러한 실시예들에서, 명령어 액세스 요구들은, 항상 보안 도메인의 보안성과 일치한다. In such embodiments, the instructions are the access requirements, should always match the performance of the security domain security. 이것으로 확실한 것은, 명령어가 아닌 데이터만을 보안 도메인과 비보안 도메인간에 공유하여도 된다는 것이다. It is clear in this respect, that will be shared only data, not commands between the secure domain and the non-secure domain. 따라서, 제어 로직(230)은, 액세스 요구를 프로세서 코어(210)로부터 NS-prot의 적절한 값을 부가하는 상기 버스(10)에 보낸다. Thus, the control logic 230, sends an access request to said bus (10) for adding the appropriate value of the NS-prot from the processor core 210. 또한, 제어 로직(230)은, 액세스 요구에 대한 영역 속성과 액세스 허가(예를 들면, 필요한 경우, 판독/기록 허가, 캐쉬 (불)가능한, 등)를 보내고 및/또는 부가하여도 된다. In addition, the control logic 230, the region attribute and the access permission for the access request is also possible to send (for example, if required, the read / write enable, the cache (Bull) available, etc.) and / or addition. 또한, 도 1에 도시된 것처럼, CPU(200)는, 통합 명령어 및 데이터 캐쉬이거나, 개개의 명령어 및 데이터 캐쉬로서 형성되는 레벨 1 캐쉬(250)를 포함한다. In addition, as shown in Figure 1, CPU (200) is, or integrated instruction and data cache, a level 1 cache 250, which is formed as the individual instruction and data cache. 일반적으로, 캐쉬 가능한 액세스 요구에 대해, 상기 제어 로직(230)에 의해, 버스(10) 상에서 전파되는 액세스 요구에 앞서 레벨 1 캐쉬(250)에서 룩업 과정이 행해질 것이고, 레벨 1 캐쉬(250)가 상기 데이터 항목이나, 상기 액세스 요구의 서브젝트인 데이터 항목을 포함하는 경우, 상기 액세스 요구는 상기 버스(10) 상에서 전파되는 액세스 요구가 필요 없이 레벨 1 캐쉬(250)를 참조하여 진행된다. In general, the cache for possible access request, by the control logic 230, will have a look-up process performed on the bus 10, the level 1 cache 250 prior to the access request that is propagated on a level 1 cache 250, a those containing the data item the subject of the data item and the access request, the access request will be conducted with reference to a level 1 cache 250, without an access request is required to be spread over the bus 10. 상기 액세스 요구에서 지정된 어드레스가 메모리의 라이트 백(write back) 영역에 관계하는 경우, 비록 (도 2의 더티 비트(160)와 유사한) 더티 비트가 상기 캐쉬에서의 엔트리를 갖는 상기 시스템 캐쉬(40)/메모리(30)에서의 엔트리를 나중에 갱신할 필 요성을 나타내도록 설정되지만, 동시에 상기 시스템 캐쉬(40) 및/또는 메모리(30)에서의 갱신을 수행하지 않고 레벨 1 캐쉬에서 갱신이 일어날 수 있다. If the address specified in the access request related to the write-back (write back) area of ​​the memory, although (similar with the dirty bit 160 in 2), the system cache 40, the dirty bit having an entry in the cache / entries in the memory 30, but set to indicate the required importance to update the future, can simultaneously lead to update in level 1 cache without having to perform any update in the system cache 40 and / or the memory 30 . 그렇지만, 어드레스가 라이트 스루(write through) 영역에 관계하는 경우, 레벨 1 캐쉬(250)에서 갱신이 일반적으로 일어날 것이고 동시에 상기 액세스 요구는 버스(10)를 거쳐 시스템 캐쉬(40)/메모리(30)에 전파되어 시스템 캐쉬/메모리에서 갱신이 일어날 것이다. However, the address is write-through (write through) case concerning the region, the level 1 will update the commonly occur in the cache 250, the access request via the bus 10, the system cache 40 / memory 30 at the same time will propagate the updates occur in the system cache / memory. 테이블 2는 디폴트 메모리 맵의 예를 나타낸다. Table 2 shows an example of the default memory map. 이러한 디폴트 메모리 맵은, TZ_NS_CTL=0일 때(즉, 보안 도메인 동작) 특정 메모리 영역에의 액세스 요구의 보안 상태가 무엇인지와 다른 액세스 속성(아래 참조)을 정의한다. This default memory map, TZ_NS_CTL = 0 be when (that is, the secure domain behavior) defines what the security status of the access request to a specific memory area and that the other access attribute (see below). 디폴트 메모리 맵은, MPU를 구현하지 못하는 CPU에 사용되어도 되거나 어느 한쪽이 디스에이블된 MPU(테이블 1의 제 1 라인 참조)를 갖는 CPU에 사용되어도 되거나, (NS-영역의 값이 정의되지 않은) 영역 디스크립터가 어드레스를 커버하지 않는 액세스 요구에 사용되어도 된다. The default memory map is to be used with CPU may be used for the CPU does not implement the MPU or the either one discharge (see the first line of Table 1) or MPU enabled, (not the value of the area defined NS-) It may be used to access the required region descriptor that does not cover the address. 상기 테이블 2에서, 일 실시예에서는, 비보안의 NS-prot값을 논리적 1값으로 하고, 보안의 NS-prot 값을 논리적 0값으로 한다. In the above table 2, in one embodiment, the NS-prot value of the non-security as a logical one value, and the NS-prot value of the security in a logical zero value. 상기 테이블 2의 예시 메모리 맵에서, 상부 6개의 메모리 어드레스 범위는, 데이터 스토리지에 대해서만 할당되고, 하부 6개의 메모리 어드레스 영역은 명령어 스토리지나 데이터 스토리지에 대해 할당된다. In the exemplary memory map of the table 2, the upper six memory address range is assigned only for the data storage, the lower six address memory area is allocated for instruction storage and data storage. 상기 데이터 전용 메모리의 경우, 기억된 데이터 항목의 실행은 가능하지 않고, 이 영역에서의 어드레스에 대한 명령어 액세스 요구는 중단될 것이다. In the case of the data-only memory, the execution of the stored data item is not available, instruction access request for an address in this area will be interrupted. 상기 데이터 전용 메모리는, 강하게 오더링된(즉, 캐쉬되지 않는) 및 공유/비공유된(즉, 멀티프로세서 디바이스 내에 하드웨어 일관성 기법으로 각각 시행될 수 있거나 될 수 없는) 영역으로 세분된다. The data-only memory is strongly-ordered (i.e., non-cache) and divided into the shared / non-shared (i.e., in the multi-processor device that can not be or may be implemented in hardware, each coherent techniques) region. 상기 하부 6개의 메모리 어드레스 영역은, 명령어 실행을 허가한다. The lower six memory address area, and permits the instruction is executed. 이들 메모리 영역의 다른 액세스 속성은, 공유/비공유 및 캐쉬 불가능, 라이트 스루(WT) 캐쉬 가능 또는 라이트 백 라이트 할당(Write back write allocate; WBWA) 캐쉬 가능 등으로 규정된다. Other properties of these access memory area, the shared / non-shared and the cache is not possible, light-through (WT) or the cache can be written back light assignment; is defined as (Write back write allocate WBWA) cache available and so on. 도 4는 디스크립터 테이블(240)에 기억된 영역 디스크립터가 존재하는 3개의 어드레스의 서브 영역(310, 320, 330)을 정의한 메모리 어드레스 공간(300)의 영역을 개략적으로 도시한 것이다. Figure 4 is a schematic illustration of a region of the area descriptor is present in the three address sub-region (310, 320, 330) a defined memory address space 300 is stored in the descriptor table 240. The 메모리 어드레스 공간(300)의 나머지는, 영역 디스크립터가 존재하지 않는(즉, NS-영역의 값이 정의되지 않는) 메모리 어드레스 영역으로 이루어지고, 이들 영역의 경우 디폴트 메모리 맵(테이블 2)을 사용하여도 된다(또는 이와는 달리, 그 영역으로의 액세스들이 중단된다). The rest of the memory address space 300, the area descriptor is not present (that is, the undefined value of the NS- region) comprises a memory address area, in the case of these areas using a default memory map (Table 2) It may be (or is stopped in contrast to access to the words, that area). 도 5는 본 발명의 일 실시예에 따른 도 3의 제어 로직(230)의 동작을 나타낸 흐름도이다. 5 is a flowchart showing operations of the control logic 230 of Figure 3 according to one embodiment of the present invention. 단계 400에서, 제어 로직(230)은, 프로세서 코어(210)로부터 수신되는 데이터 액세스 요구를 기다린다. In step 400, the control logic 230 waits for the data access request that is received from the processor core 210. 단계 410에서 데이터 액세스 요구를 수신하면, 디스크립터 테이블(240)에서의 검색을 행한다. When receiving the data access request at step 410, it performs a search in the descriptor table 240. The 다음에, 단계 420에서 충돌이 일어나지 않은 것이 확증되면, 단계 430에서는 디폴트 메모리 맵 엔트리가 대응한 어드레스에 사용가능한지를 검사한다. When it is confirmed in the following, that a collision occurs in step 420, in step 430 it is checked it is acceptable for a default memory map entry corresponding to the address. 사용 가능하지 않은 경우 중단 명령을 내린다(단계 440). If you do not enable the break down command (step 440). 상기 어드레스에 대한 디폴트 메모리 맵 엔트리일 경우, NS-prot는 그 정보로부터 생성되어(단계 450), 그 NS-prot 값과 필요한 허가를 갖는 그 어드레스를 출력한다. If the default memory map entry for the address, NS-prot, and outputs the address having been generated (step 450), the NS-prot value and the necessary clearance from the information. 단계 420에서 충돌이 있는 경우, 디스크립터 테이블에서 하나보다 많은 충돌이 일어났는지를 검사한다(단계 460). If there is a conflict, at step 420, checks natneunji many conflicts occurred in more than one descriptor table (step 460). 이것은 본 실시예에서 가능하고, 여기서 다수의 오버랩핑 영역 디스크립터, 예를 들면, 특정 메모리 디바이스에서의 모든 어드레스에 대해 정의된 공통 영역 디스크립터와 그 디바이스 내에 어떤 어드레스에 대해 정의된 특정 영역 디스크립터도 가능하다. It is possible in this embodiment, in which multiple overlapping region descriptor, for example, it is also possible to a certain region descriptor that is defined for the certain address within the common region descriptors and the device defined for all addresses in the particular memory device . 하나보다 많은 충돌이 있는 경우, 단계 470에서는 최고의 우선 순위 충돌을 선택하도록 우선 순위 기준을 적용한다, 즉, 주어진 어드레스에 대해 정의된 상기 영역 디스크립터 전체 중에서 최고의 우선 순위를 갖는 영역 디스크립터를 적용한다. If the number of collisions than one, step 470, we apply priority criteria to select the highest priority conflict, that is, applies a region descriptor that has the highest priority among all of the area descriptor is defined for a given address. 단계 480에서, 제어 로직(230)은 TZ_NS_CTL의 수신된 값에 따른 NS-prot의 값과 상기 선택된 영역 디스크립터의 NS-영역 값을 발생한다. In step 480, the control logic 230 generates a value of NS-prot in accordance with the received values ​​and NS- region of the selected region of the descriptor value TZ_NS_CTL. 끝으로, 단계 490에서는, 필요한 경우 연관된 NS-prot 값과 허가에 의해 버스(10) 상에서 또는 직접 레벨 1 캐쉬(250)에, 데이터 액세스 요구를 출력한다. Finally, in step 490, and outputs, if necessary, to the bus 10 or directly to the level 1 cache 250, on the by the NS-prot value associated with the permission, the data access request. 요약하면, 본 발명의 실시예의 상기 설명에 의한 데이터 처리장치 및 액세스 요구 발생방법을 제공한다. In summary, there is provided a data processing device and an access request generation method according to the embodiment, the description of the invention. 외부로부터 버스 마스터에 수신된 신호에 따라 상기 데이터 처리장치의 보안 도메인 또는 비보안 도메인에서 동작할 수 있는 버스 마스터가 구비된다. The bus master capable of operating in secure domain or non-secure domain of the data processing device is provided in accordance with the received signal to a bus master from the outside. 신호는, 버스 마스터의 정상 동작시에 고정되도록 발생된다. Signal is generated so as to be fixed at the time of normal operation of the bus master. 그 버스 마스터 디바이스가 보안 도메인에서 동작하고 있는 경우, 디폴트 메모리 맵이나 안전하게 정의된 메모리 영역 디스크립터에 따라, 보안 액세스 또는 비보안 액세스를 나타내는 버스 마스터 코어에 의해 발생된 액세스 요구와 연관된 도메인 지정 신호를 발생할 수 있는 제어 로직이 구비된다. The bus master device when operating in the secure domain, a default memory map and safely according to the defined memory area descriptors, can cause the access request and the domain-specific signal associated generated by the bus master core showing a security access or non-access the control logic is provided with. 이와 같이, 보안 도메인에서 동작하는 버스 마스터는, 그 자체가 보안 동작과 비보안 동작간에 전환 가능하지 않고, 보안 액세스와 비보안 액세스 양쪽을 발생할 수 있다. In this way, the bus master is operating in the secure domain, in itself it is not possible to switch between secure and non-secure operating action, can cause a security access and non-secure access both. 여기서는 특정 실시예를 기재하였지만, 본 발명은 이에 한정되지 않고 또 본 발명의 범위 내에서 여러 가지 변형 및 여기에 추가하여도 된다는 것을 알 것이다. Here been described a particular embodiment, it will be understood that the invention is also that in addition to the various modifications and here within the scope of the present invention also is not limited to this. 예를 들면, 아래의 종속항의 특징을 본 발명의 범위를 벗어나지 않고 독립항의 특징과 각 종 조합을 할 수 있다. For example, without departing from the scope of the present invention characterized in the dependent claims below, it may be the characteristic of the independent claim and the respective kinds in combination. 상기 버스 마스터 디바이스가 상기 보안 도메인에서만 동작하고 있는 것을 상기 도메인 지정 신호가 나타내는 경우, 상기 액세스 요구에 의해 지정된 상기 어드레스에 따라, 상기 도메인 제어 로직은, 상기 액세스 요구와 연관되는 비보안 도메인 보안신호를 선택적으로 발생할 수 있는 것을 특징으로 하는 데이터 처리장치. When the bus master, said domain specifying signal that the device is operating only in the secure domain represents, it said domain control logic in accordance with the address designated by the access request is an optional non-secure domain security signal to be associated with the access request data processing apparatus, characterized in that you might encounter. 상기 도메인 제어 로직은, 다수의 메모리 영역의 각각에 대해 액세스 제어 정보를 식별하는 메모리 맵으로의 액세스와, 상기 보안 도메인에서 동작시에 상기 버스 마스터 디바이스에 의해 액세스 요구가 발행된 경우에 상기 메모리 영역 내에 어드레스를 지정하는 액세스 요구와 연관지어 발행되어야 하는 도메인 보안 신호의 지시를 가지는 것을 특징으로 하는 데이터 처리장치. The domain control logic has access and the memory area when the when operating in the secure domain said bus by a master device an access request issued to a memory map identifying access control information for each of the plurality of memory areas data processing apparatus characterized by having an indication of the domain security signal that should be issued in conjunction with an access request specifying an address. 상기 도메인 제어 로직은, 영역 디스크립터를 액세스하고, 각 영역 디스크립터는, 메모리 영역과 연관되고, 그 메모리 영역에 대해 영역 보안 지시를 제공하고, 상기 영역 디스크립터는 보안 도메인에서 실행하고 있는 소정의 소프트웨어에 의해 프로그래밍 가능하고, 상기 도메인 제어 로직은, 상기 도메인 지정 신호와 액세스에 의해 지정된 어드레스를 포함하는 상기 메모리 영역의 상기 영역 디스크립터의 상기 영역 보안 지시의 조합으로부터, 각 액세스 요구의 상기 영역 보안 신호를 얻을 수 있는 것을 특징으로 하는 데이터 처리장치. The domain control logic has access to region descriptors, each region descriptor, is associated with a memory region, providing a region security indication for that memory region, said region descriptors by predetermined software that is running in the secure domain programmable, said domain control logic is, from a combination of said region security indication of the region descriptor for the memory region containing the address specified by said domain specifying signal and access, to obtain the area security signal for each access request data processing apparatus, characterized in that. 상기 도메인 제어 로직은, 상기 버스 마스터 디바이스가 상기 보안 도메인에서만 동작하고 있는 것을 상기 도메인 지정 신호가 나타나는 경우에 상기 영역 보안 지시에 따라 상기 도메인 보안 신호를 발생할 수 있는 것을 특징으로 하는 데이터 처리장치. The domain control logic, data processing apparatus, characterized in a case where the bus master, said domain specifying signal that the device is operating only in the secure domain may appear that there may occur the domain security signal in accordance with the security region indicated. 상기 어드레스가 영역 디스크립터를 갖는 메모리 영역에 있는 경우, 상기 도메인 보안 신호는 상기 영역 보안 지시 및 상기 도메인 지정신호의 상기 조합으로부터 얻어지는 한편, 이와는 달리 상기 도메인 보안 신호는 상기 메모리 맵으로부터 얻어진 상기 액세스 제어 정보로부터 얻어지는 것을 특징으로 하는 데이터 처리장치. If the memory area, the address having a region descriptor, said domain security signal is the other hand, alternatively the domain security signal that is obtained from the combination of the region security indication and said domain specifying signal is the access-control information obtained from said memory map data processing apparatus, characterized in that obtained from. 상기 도메인 제어 로직은, 상기 버스 마스터 디바이스가 상기 비보안 도메인에서만 동작하고 있는 것을 상기 도메인 지정신호가 나타내고 있는 경우, 비보안으로서 상기 도메인 보안 신호를 항상 발생할 수 있는 것을 특징으로 하는 데이터 처리장치. The domain control logic is the bus master, if the device is in the said domain specifying signal indicates that operates only in the non-secure domain, the data processing apparatus is characterized in that always cause the domain security signal as non-secure. 상기 도메인 지정 신호는, 상기 버스 마스터 디바이스로의 정적 입력인 것을 특징으로 하는 데이터 처리장치. Said domain specifying signal is a data processing device, it characterized in that the static input to said bus master device. 상기 도메인 지정 신호를 발생할 수 있는 보안 제어 로직을 더 구비한 것을 특징으로 하는 데이터 처리장치. Data processing apparatus, characterized in that further comprising a security control logic that may occur to said domain specifying signal. 상기 도메인 지정 신호는 상기 버스 마스터 디바이스의 리셋에 따라서만 변경 가능한 것을 특징으로 하는 데이터 처리장치. It said domain specifying signal is a data processing apparatus, characterized in that possible changes only in accordance with the reset of said bus master device. 상기 버스 마스터 디바이스는 부팅시에 상기 보안 도메인에서 동작을 시작하고, 상기 보안 제어 로직은 이후의 부트 프로세스에서 비보안 도메인 지정신호를 발생하도록 전환할 수 있고, 상기 보안 제어 로직은 이후 재부팅이 발생할 때까지 비보안 도메인 지정 신호만을 생성할 수 있는 것을 특징으로 하는 데이터 처리장치. The bus master device can be switched to generate the specified non-secure domain signal in the start operation in the secure domain, said security control logic is the boot after the process at the time of booting, until the security control logic may cause a subsequent reboot data processing apparatus, characterized in that that can be generated by only the non-secure domain specifying signal. 상기 버스 마스터 디바이스가 상기 보안 도메인에서만 동작하고 있는 것을 상기 도메인 지정 신호가 나타내는 경우, 상기 액세스 요구에서 지정된 상기 어드레스에 따라, 상기 도메인 제어 로직수단은, 상기 액세스 요구와 연관되는 비보안 도메인 보안신호를 선택적으로 발생하는 것을 특징으로 하는 데이터 처리장치. The bus master if the device is said domain specifying signal indicating that the operation only in the secure domain, in accordance with the address designated by the access request, means the domain control logic, optionally the non-secure domain security signal to be associated with the access request data processing apparatus characterized in that it occurs. 상기 보안 도메인에서만 동작하고 있는 것을 상기 도메인 지정 신호가 나타내는 경우, 상기 어드레스에 따라, 상기 액세스 요구와 연관되는 비보안 도메인 보안신호를 선택적으로 발생하는 단계를 포함한 것을 특징으로 하는 데이터 처리장치에서의 액세스 요구 발생방법. If said domain specifying signal indicating that the operation only in the secure domain, the access request in a data processing device, characterized in that, including the step of: in response to the address, selectively generate the non-secure domain security signal to be associated with the access request how occurred.